Semi-hermetic Screw compressors in association with HFC refrigerants R134a & R407C have now come to dominate as preferred compressor for most medium to large capacity Water Chillers. These machines demonstrate previously unknown levels of robustness, energy efficiency, quietness, plus they tolerate adverse affects of variable superheat characteristics, particularly with blended refrigerants, at a level that would simply destroy an equivalent reciprocating compressor. Many maintainers are unaware of the importance of regular bearing replacement overhaul upon these machines. Traditional reciprocating compressors were routinely “run until broken”, however replacements were easily available, and at attractive prices, with 9 out of 10 reciprocating exchange returns quite suitable for re-manufacture. This is not the case with Screw Compressors! Moving parts are restricted to one rotor with gate (star) rotors or more commonly two parallel rotors, plus a slide valve device for capacity variation. Critical clearances between the rotors and static casings are extremely close, and herein lays a crucial problem when failure occurs. According to model, Screw compressors spin at 3 - 8,000 rpm, at least twice the speed of reciprocating compressors. When mechanical failure occurs any metallic debris produced before the machine finally stops is dragged through the screw mechanism by the highly effective pumping action, yet more debris and damage in the process. It is this final effect that often renders a machine beyond repair. Indeed 3 – 4 out of 5 Screws that suffer mechanical failure are left irreparable. With a vast range of individual Makes & Models, individual models are far fewer, making most models simply not available as redundant castings, thus often the only option is the high expense of a new compressor. Invariably failure occurs at the least convenient moment, leading to urgent repairs and even more expense. Screw compressors are robust machines, and will routinely suffer system faults that would destroy an equivalent capacity reciprocating model. However, in order to achieve the close tolerances and high operational speeds Industrial Rolling Bearings are used. Also there is a natural pull upon the compressor rotor/s toward the direction of the suction, thus a particular type of bearing, the “Angular Contact Ball Bearing” is required to resist this thrust. Rolling bearings have a finite fatigue life typically around 25,000 hours, or between 3 - 5 years average service. Some manufacturers suggest bearing overhaul procedures, but some prefer to sell a new replacement when failure occurs. Unless replacement is carried out, failure shall be expensive, inconvenient and a certainty as run hours increase. 1: Copper plating. 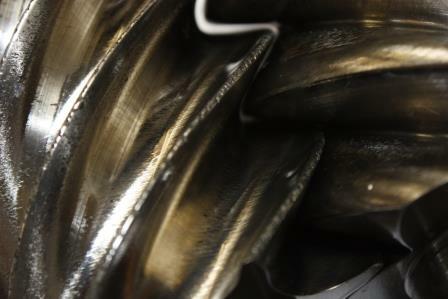 Prevalent in over 70 % of compressors we examine. If allowed to build up the generated copper debris interferes with the close running tolerances of the compressor bearings and rotors and leads to binding or excessive loading upon the rolling element bearings and ultimately failure. This can also cause problems with the Slide Valve, causing the mechanism to stick, preventing proper load control. 2: Light load running. Whereas these compressors will tire more quickly at high head pressures, compressors that run consistently at low load settings generally display more internal wear than higher loaded machines. 3: Spalling of the bearing. Bearing failure is caused by fatigue spalling. After many millions of revolutions small cracks form beneath the hardened surface of the rolling elements. Eventually these cracks lead to flaking of the surface material, and rapid failure due to debris interference and immense frictional heat. Critical to Screw compressors are the thrust bearings mentioned. If control of thrust is lost the immediate effect is a catastrophic failure as the screw rotors collide with suction housing. Had the machine been stopped prior to bearing failure for routine renewal of the bearings, the secondary damage will be completely avoided. Time between initial spall and failure is brief with little chance to stop the compressor. No conventional safety device exists to detect the actual failure in the early stages, thus the machine relies upon other safety devices to operate, e.g. fuses, thermal overloads, or circuit breaker, by which time the internal damage is done. High run hours leading to Spalling is the most common and preventable failure affecting Screw compressors. Periodic replacement of the rolling element bearings will extend life and whilst the compressor is dismantled any other gathering problems such as Copper Plate (caused by system contaminants) can be identified and corrected early. Screw Compressors now represent approximately 70% of the throughput at ThermaCom Ltd. Makes routienly overhauled include: Hitachi, Bitzer, Frascold, Trane, Kobe, Daikin, Gram, Stal, Refcomp, Hall, Carrier, Sabroe, Fu Sheng, Hanbell and York. ThermaCom are also UK Distributor for Hanbell, and can also offer duty matched replacements to replace obscure or expensive OE supplied compressors. If you require further information upon the techniques available to reduce maintenance and renewal costs upon these machines or the cutting edge technology currently available to our industry from bearing manufacturers such as SKF, NSK or FAG then why not give our technical staff a call.